How to raise money for BC Children’s Hospital? Kim’s son Erik was a cardiology patient at BC Children’s Hospital in 1999. Today, Erik continues with annual visits to the Hospital to monitor his heart function but otherwise he is a healthy, athletic 18-year-old. 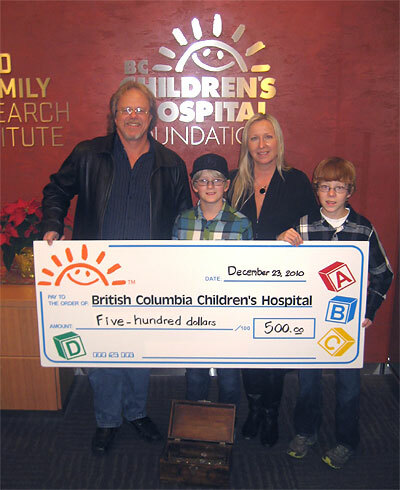 In addition to Kim’s support of Children’s through the RE/MAX Miracle Home Program, the Johannsens recently raised $600 for BC Children’s Hospital Foundation. To celebrate Kim’s 50th he held a pirate-themed party and the family asked his friends and extended family to donate ” dubloonies” to his pirate chest. Erik also raised $100 on his own through a garage sale. Visit BC Children’s Hospital Foundation website to learn more! For more information about Sold on a cure please contact me or click here.